Amazon’s ad business is blowing up in 2018. While Google and Facebook can only infer about buying intentions, Amazon’s wealth of first-hand consumer purchasing data is enabling savvy marketers to greatly improve their ad targeting across the entire customer purchase funnel. However, navigating the the spectrum of Amazon’s ad offerings (and the growing list of acronyms), has proved to be a daunting task for many brands. The Amazon advertising landscape is dominated by three acronyms: AMG, AMS, and AAP, and in this article we will breakdown the advertising products available from Amazon. Amazon’s primary two advertising platforms are AMS (paid search) and AAP (programmatic ad buying), and AMG refers to the in-house business team that sells Amazon’s ad products. The AMG team works closely with agencies and businesses to help them leverage Amazon’s ad offerings more effectively. As a managed service, AMG offers the complete planning and execution of all advertising activities on Amazon. This includes display banners, video ads, and custom ad units, displayed across Amazon and Amazon owned sites including IMDb and Kindle. AMS and AAP are also available as self-service, however AMS is only available for vendors and 3P sellers with Brand Registry. AMS campaigns can also be initiated with almost no budget requirements, while using AAP will require significantly higher advertising budgets. AMS is Amazon’s pay per click (PPC) paid search marketing platform, and offers brands three advertising formats; Sponsored Products, Headline Search ads, and Product Display ads. AMS is available for vendors and 3P sellers (with Brand Registry), and the ads will send customers to a product detail page or custom landing page on Amazon. Ad targeting is on the keyword level, and Sponsored Products and Headline Search ads are the most popular ad formats utilized by vendors and sellers, with Sponsored Products offering the most granular control over ad targeting precision. AAP is Amazon’s programmatic ad buy platform, and enables brands to target Amazon shopper audiences off of Amazon.com and Amazon owned sites. While Amazon’s search ads use a pay-per-click (PPC) model, AAP campaigns are cost-per-impression (CPM) based. With AAP, brands can choose to work with an in-house Amazon team to plan and execute their programmatic ads, or opt for the self-service AAP platform Amazon opened for advertisers in 2014. 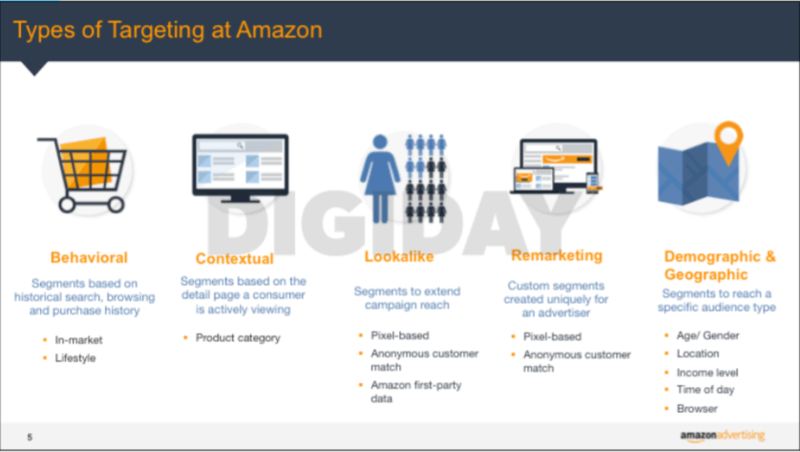 The introduction of Advertiser Audiences in AAP has enabled brands to build custom audience segments based on first-party data from Amazon. 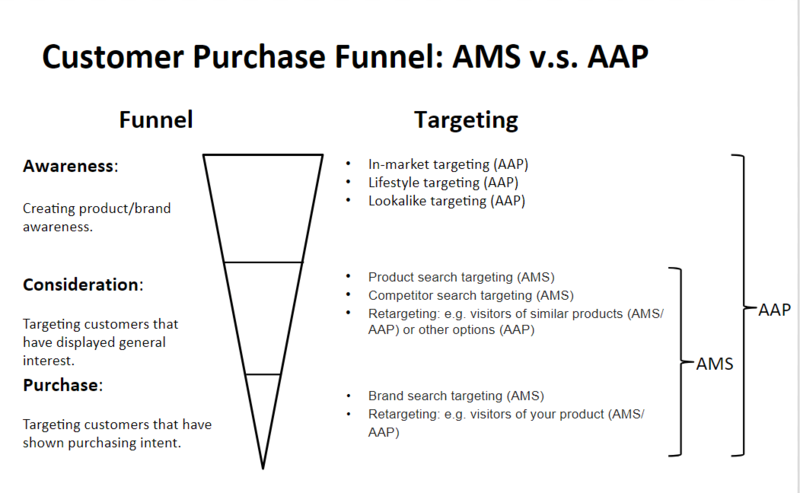 Where do AMS and AAP fit in the marketing funnel? AMS and AAP are very different advertising solutions offered by Amazon, and each platform has its own specific advantages depending on the buyer phase you are targeting in the marketing funnel. AMS campaigns are very effective for lower funnel sales conversion, where the customer is already at the point of purchase- namely browsing Amazon search results or on Amazon product pages. AAP offers ad products across the entire marketing funnel, and is particularly relevant for top of funnel targeting, where attention for products/brands must first be created. AAP’s extended ad coverage across the entire funnel makes the platform particularly interesting for products that have a longer purchasing journey, typically seen with more expensive products. Use our PPC Manager to maximize your AMS revenue and decrease manual hours spent on AMS management. You can now see your aggregated Sponsored Products and Headline Search ads ad spend and sales in Sellics! Learn more here.